The research report on the global gluten-free food market provides a 360-degree view of the market. This research study is titled “Gluten Free Food Market - Global Industry Analysis, Size, Share, Growth, Trends, and Forecast 2015 - 2021”. In terms of value, the global gluten-free food market is projected to expand at a 7.70% CAGR during the forecast period from 2015 to 2021. In 2014, the global gluten-free food market was worth more than US$2.8 bn and by 2021, the market is projected to be worth over US$4.8 bn. Around the world, the stress on weight management is growing. Consumers are getting more aware about the health benefits provided by gluten-free products in weight management. These health trends are expected to drive the global gluten-free food market significantly. In addition to this, rising demand for innovative gluten-free bakery items is increasing, which will further fuel the global gluten-free food market. On the other hand, the lack of awareness about celiac disease will suppress the market. Many people around the world are either misdiagnosed or undiagnosed for celiac disease. By product type, the global gluten-free food market is divided into gluten-free ready meals, gluten-free pasta, gluten-free baby food, and gluten-free bakery products. The segment of gluten-free bakery products dominated the global gluten-free food market in terms of both value and volume in 2014. This segment is projected to continue its dominance throughout the forecast period. This segment is driven by the rise in the consumption of gluten-free biscuits around the world. Furthermore, the growing awareness about gluten-free bakery products has allowed manufacturers to shift their focus from the specialty diabetic sector to the gluten-free bakery products sector. Geography-wise, the global gluten-free food market is segmented into Latin America, the Middle East and Africa, Asia Pacific, Europe, and North America. In 2014, Europe dominated the global gluten-free food market with a 52.5% revenue share, followed by North America and Asia Pacific. According to the report, Europe will continue to lead the global gluten-free food market till the end of forecast period, trailed by North America. The Europe gluten-free food market is driven by the growing awareness about celiac disease. In addition to this, the increasingly heavy merchandizing by manufacturers in food service and grocery channels is also fuelling this regional market. The U.S. is the fastest growing national market in North America. 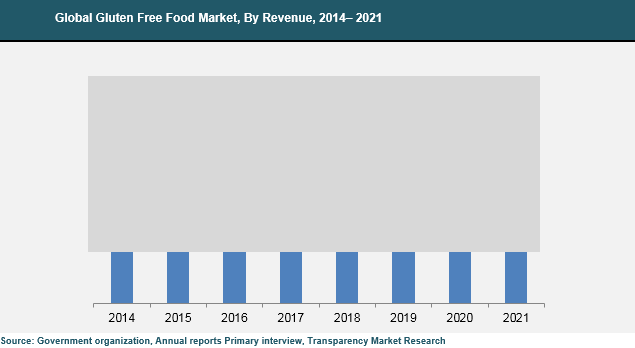 The U.S. market for gluten-free food is driven by the increasing number of celiac disease patients and the growing positive reaction of consumers to gluten-free diet.Players in the global gluten-free food market will benefit from the rising focus on the fresh food industry. Hence, manufacturers are gradually expanding their offerings and besides bakery products, pasta, and ready meals, they are focusing on providing fresh food. Some of the key players operating in the global gluten-free food market are Genius Foods, Freedom Foods Group, Hain Celestial Group, Boulder Brands, and Dr. Schar.